Good day everyone! Today I would like to share with you a product that will help your skin feel smooth, moisturized and refreshing. But before that a little information about this product. As you know, New Zealand is the home of the world's finest Kiwifruit. Kiwifruits are naturally high in vitamins, minerals, antioxidants and Omega-3, which helps with skin enhancement. The most important vitamin for the skin would be Vitamin E which helps to regenerate the skin's cells and maintain tone and elasticity. Antioxidant properties helps by protecting our skin from environmental stress that causes premature ageing. What to expect from this product? Minimised fine lines and wrinkles and a softer and younger looking complexion. Wild Fern has a few range of skin care and body products, but today I'll be reviewing their Light 'n' Luscious Body Wash and Silky Smooth Body Lotion. Kiwifruit contains a natural enzyme which acts as a gentle exfoliant to remove dry skin cells leaving your skin soft, smooth and refreshed. The scent of this body wash is refreshing, smells good which makes my daily shower refreshing and relaxing. However this body wash does not build up a lot of foam. I usually prefer body wash with more foam or else I would feel unclean. 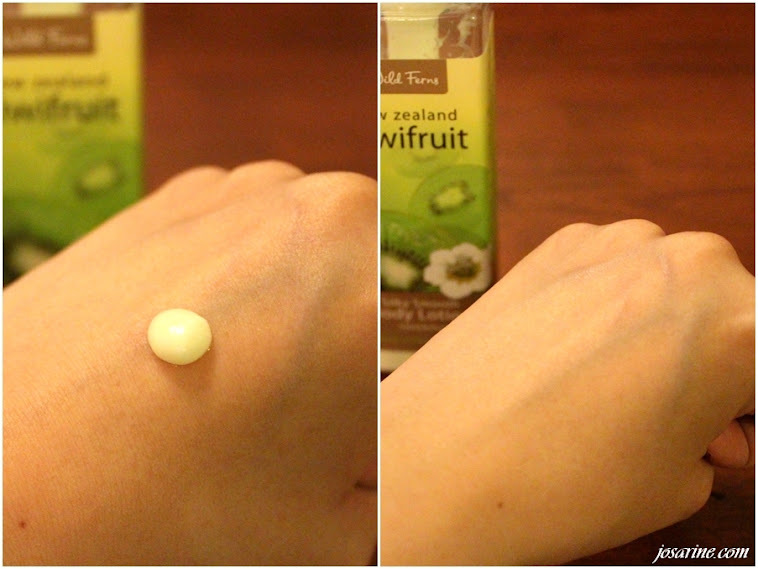 The Kiwi seeds helps to gently exfoliate but for me it didnt feel much of a difference. I do not feel squeaky clean using this body wash.
Would I purchase? As much as I love the scent, I would say no because of the lack of foam build up. Moisturises and softens dry and thirsty skin. This on the other hand is wonderful. It has been my best friend especially when I sit in air-conditioned room the whole day at work. Whenever my skin feels dry I would apply this on my body and the smell is so refreshing, not too relaxing that would make me fall asleep. So I would say perfect for me when I'm at work. After application skin does not feel sticky, but smooth and refreshed. Would I repurchase? Maybe because I am still open to trying other body lotions first before i settle for one I really like.